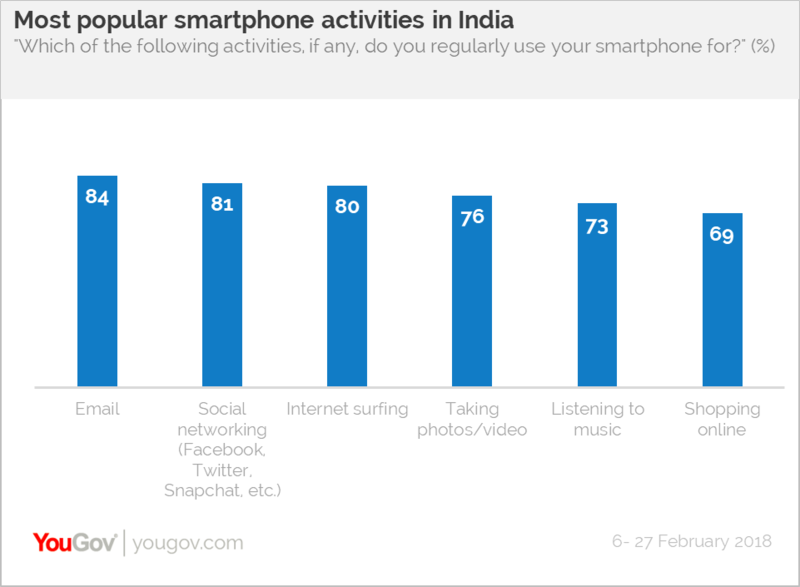 on March 8, 2018, 7:48 p.m.
Fresh research into smartphone usage in India has shown that 67% of the country’s urban online population couldn’t live without their smartphone, the largest majority of whom are aged between 60 and 65. The YouGov survey conducted among over 1,000 citizens in India, shows that 79% of respondents aged 60-65 need their smartphone the most. By comparison the results indicate youth are less reliant with 63% of those aged between 20 and 25 agreeing they couldn’t live without their phone device. The study highlights, for the vast majority of older generations, the connection smartphone devices offer is of major appeal with very few seeing them as a distraction. While larger proportions of the younger generation, particularly 15-20 year olds (27%), do see their smartphone as a distraction. Overall, just over half of Indians spend four or more hours a day on their smartphone, with a third using it for between four and six hours, and a fifth using it for six hours or more per day. For most, checking their smartphone is one of the first things they do when they start the day. The results show 74% of respondents check their phone within 15 minutes of waking up, with 26% checking it immediately, while nearly half check it within five or 15 minutes of opening their eyes. The trend doesn’t change at bed time, with the vast majority of respondents (80%) checking their phone within 15 minutes of going to sleep, half of them either check it immediately before they close their eyes, or five minutes before. Interestingly, just under two thirds of respondents actually check their smartphone in the middle of the night upon receiving a notification. 20% of those surveyed claim they always look at their phone at night, while 42% sometimes check their phone in the dark hours. The largest proportion of night-time users are aged between 25 and 35. The most popular smartphone activity is checking emails according to 84% of respondents, while 81% also like to stay tuned on social media. In fact, the research highlights social media and messaging apps are the most installed apps on smartphones in the country, the most popular of which is WhatsApp used by 94% of respondents, and over 90% of respondents in all age groups. YouTube is the second most popular app, used by 89% of the sample and Facebook is used by 85%. 71% also use Facebook Messenger. The majority spend most of their time on WhatsApp, with 67% of respondents saying they use the messaging phenomenon four or more times a day. Meanwhile 45% use Facebook and a third use YouTube just as much. A significant proportion (69%) of respondents also choose to use their smartphone device to shop online, to that end 47% also have ecommerce apps installed. However, two thirds of the sample also like to use their phone while out shopping. Most (60%) use it to compare prices, while 58% like to take a picture of the product and 55% use it to search for more information.